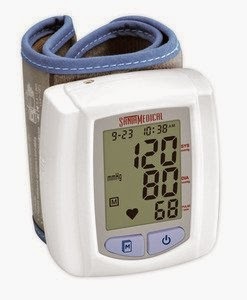 I received a Santamedical Wrist Digital Blood Pressure Cuff. I have always wanted one and this is a great addition to my first aid supplies. My blood pressure has been creeping up over the past couple years -- before it used to be abnormally low. And with my adrenal fatigue my blood pressure drops when I stand up from a sitting or laying position too quickly. So this blood pressure monitor is perfect for me. My blood pressure is now averaging between 115 and 120 over 90 most of the time. It does drop when I sit up, but years ago my blood pressure was at the highest, 85/70 and many times much lower than that. So I like to monitor it. And now I can. There are some neat features with this unit. 1. It was SO easy to use. It comes with an instruction sheet, but I didn't even need to use it. 2. It has some new technology that allows it to automatically inflate to the appropriate level. It won't ever over inflate or become too tight. 8. It comes with batteries! I LOVE it when things come with batteries. SantaMedical products are used by clinics and hospitals all over. The convenience and portability is great, and it comes with a hard plastic case to protect it when not in use. It comes with a one year warranty.